Kamagra Tablets , Kamagra Soft Tablets and Kamagra Jelly are cheap, yet effective impotence treatments for men. Each generic Kamagra tablet and Soft Tablet contains 100mg sildenafil citrate. Kamagra jelly sachets also contain 100mg of sildenafil citrate in liquid gel form. The impotence drug is manufactured by Indian Pharmaceutical Laboratory Ajanta Pharma. Kamagra has been clinically tested and proven to work. Kamagra Soft Tablets are chewable. The gummy tablet can also be dissolved under the tongue. It takes roughly 10 minutes for the soft tablet to fully dissolve under the tongue. The chewable tablet will not stick to dental work if chewed. Kamagra Soft Tablets are available on this site in 100mg doses. In order to acheive a lower dosage, the soft tablet may be split in half. Kamagra Tablets are effective in under 20 minutes IF dissolved under the tongue. 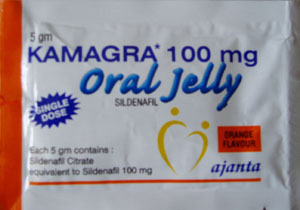 Kamagra Jelly is sildenafil citrate in liquid jelly form. The jelly can be sipped up directly from the sachet. Men that buy kamagra jellies often comment feeling the effects of Kamagra faster. The jelly is absorbed via the buccal cavity which means that the sildenafil bypasses the digestive system and reaches the bloodstream faster. Kamagra Jelly works typically in under 15 minutes. Kamagra Jelly is packaged in convenient sized sachets. Each 100mg sachet contains the equivalent to 1 Kamagra 100mg tablet. The Kamagra products are dispensed in 100mg doses only. Splitting a 100mg tab in half in order to achieve a lower dose (eg, 50mg) is suitable. Do not exceed more than one dose per day. Only your doctor can recommend the right dose for you. Why should I take Kamagra instead of Viagra? Kamagra is cheaper than Viagra. Kamagra is manufactured by Ajanta Pharma, an audited and approved pharmaceutical laboratory that is fully regulated and complies with international good manufacturing practices set forth by the World Health Organization. Pfizer is a pharmaceutical giant which discovered that Sildenafil Citrate actually produces erections in men. Sildenafil Citrate had long exhisted but it was used for other medical purposes. Sildenafil was being used for men with certain heart conditions and it was during clinical trials that men began reporting firmer, longer lasting erections. Pfizer quickly patented a method in which Sildenafil is formulated to treat ED. Until the patent expires in 2010, no other company has the permission to formulate Sildenafil using the same method as Pfizer has used, however, Sildenafil may be formulated using other methods which will essentially deliver the same exact results. Kamagra is not Viagra because Viagra is a brand name for Sildenafil Citrate, however, Kamagra is Sildenafil Citrate and works just like Viagra. The main differences between the two ED treatments is the aesthetic look, the cost and the form in which the treatments are dispensed. Kamagra's selling prices are low because Ajanta Pharma does not have to recover the R&D investment and maintains a low overhead with minimal marketing efforts. Kamagra has different labeling, flavors, packaging, color and shape. Kamagra has passed the strict manufacturing guidelines. Kamagra Tablet Side Effects: All medications which contain sildenafil may produce minor side effects in some men. The most common Kamagra side effects include headache, facial flushing, stomach problems and tinted blue vision. The side effects will typically disappear within a few hours. Other side effects which are more severe include dizziness, chest pain and nausea. Click the button below to add the Kamagra (Sildenafil Citrate) Oral Jelly 100mg to your wish list.